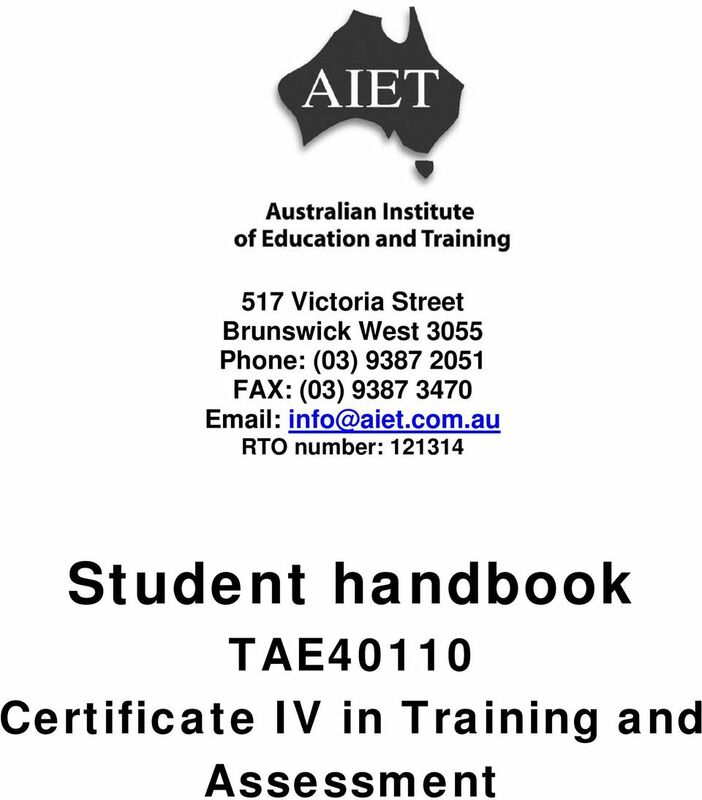 Download "517 Victoria Street Brunswick West 3055 Phone: (03) 9387 2051 FAX: (03) 9387 3470 Email: info@aiet.com.au RTO number: 121314." 3 This work is copyright. Apart from the use as permitted under the Copyright Act 1968, no part may be reproduced without prior written permission. However, permission is given to claimants to make copies by photocopying or other duplicating processes for use in the training program or course for which they are enrolled. This permission does not extend to the making of copies for use outside this group of applicants nor the making of copies for hire or resale to third parties. Requests and enquiries concerning other reproductions and rights should be made to AIET. WELCOME We welcome you to the Australian Institute of Education and Training. 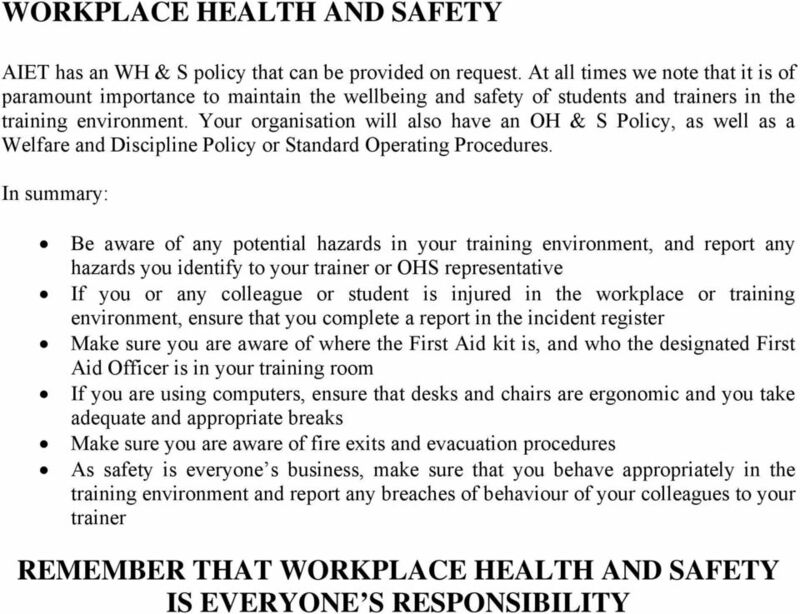 This student handbook outlines the responsibilities that you have to AIET and the responsibilities that we have to you. 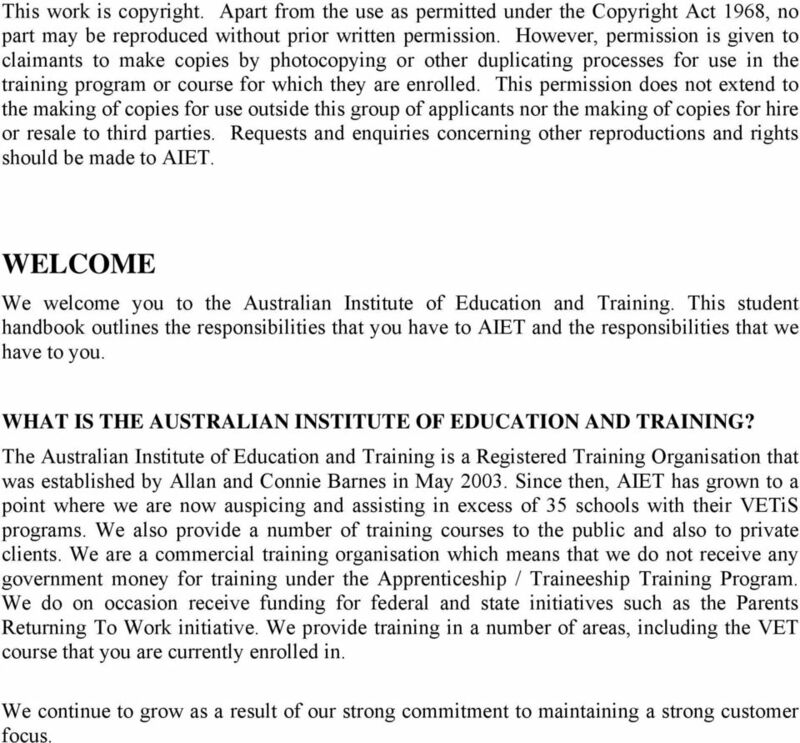 WHAT IS THE AUSTRALIAN INSTITUTE OF EDUCATION AND TRAINING? 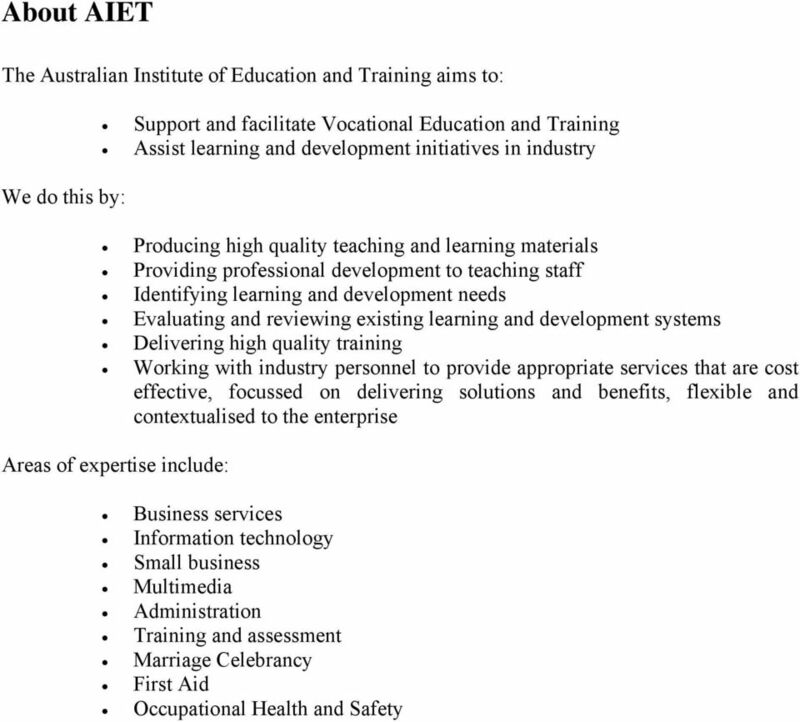 The Australian Institute of Education and Training is a Registered Training Organisation that was established by Allan and Connie Barnes in May Since then, AIET has grown to a point where we are now auspicing and assisting in excess of 35 schools with their VETiS programs. We also provide a number of training courses to the public and also to private clients. We are a commercial training organisation which means that we do not receive any government money for training under the Apprenticeship / Traineeship Training Program. We do on occasion receive funding for federal and state initiatives such as the Parents Returning To Work initiative. We provide training in a number of areas, including the VET course that you are currently enrolled in. We continue to grow as a result of our strong commitment to maintaining a strong customer focus. 9 Who might AIET disclose personal information to? 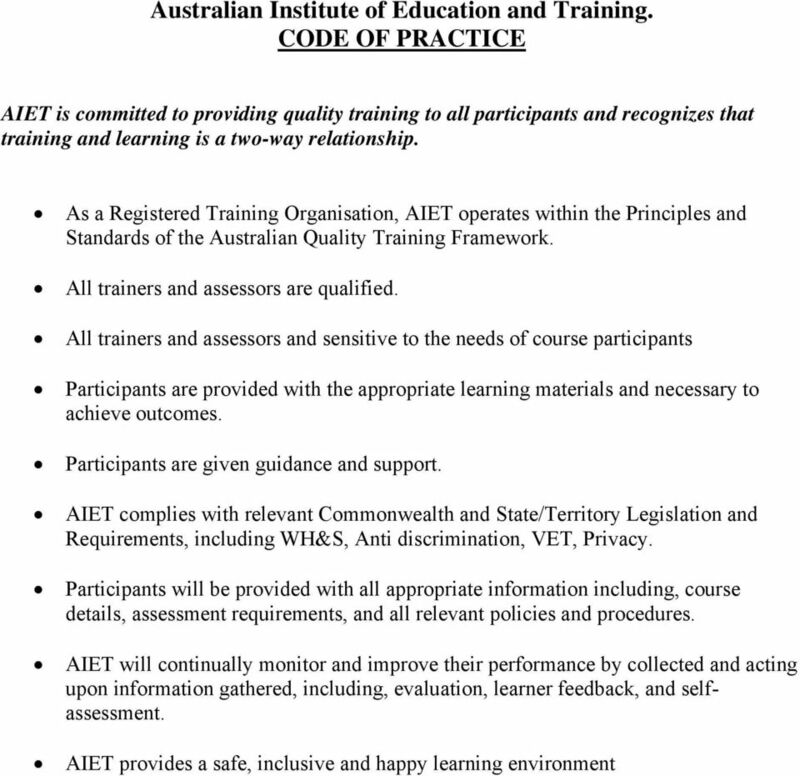 AIET may disclose personal information, including sensitive information, held about an individual to: Government departments as directed and required Medical practitioners as directed and required People providing services to AIET, including trainers Anyone the individual authorises AIET to disclose information to. How does AIET treat sensitive information? In referring to sensitive information, AIET means: Information relating to a person s racial ethnic origin, political opinions, religion, trade union or other professional or trade association membership, sexual preferences or criminal record, that is also personal information; and health information about an individual. Sensitive information will be used and disclosed only for the purpose for which it was provided or a directly related secondary purpose, unless the individual agrees otherwise, or the use or disclosure of the sensitive information is allowed by law. Management and security of personal information AIET s staff are required to respect the confidentiality of students personal information and the privacy of individuals. AIET has in place steps to protect the personal information AIET holds from misuse, loss, unauthorised access, modification or disclosure by use of various methods including locked storage of paper records and password protected access rights to computerised records. Updating personal information AIET endeavours to ensure that the personal information it holds is accurate, complete and up-to-date. A person may seek to update their personal information held by AIET by contacting the Administrative Officer of AIET at any time. The National Privacy Principles and the Health Privacy Principles require AIET not to store personal information longer than necessary. 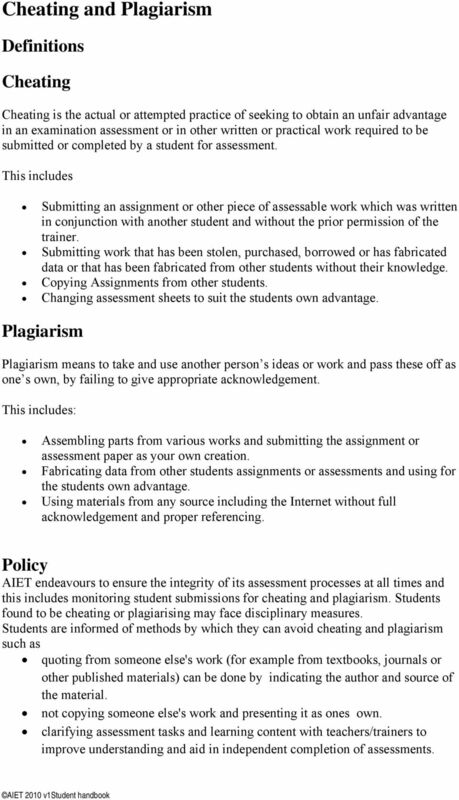 Students have the right to check what personal information AIET holds about themselves. 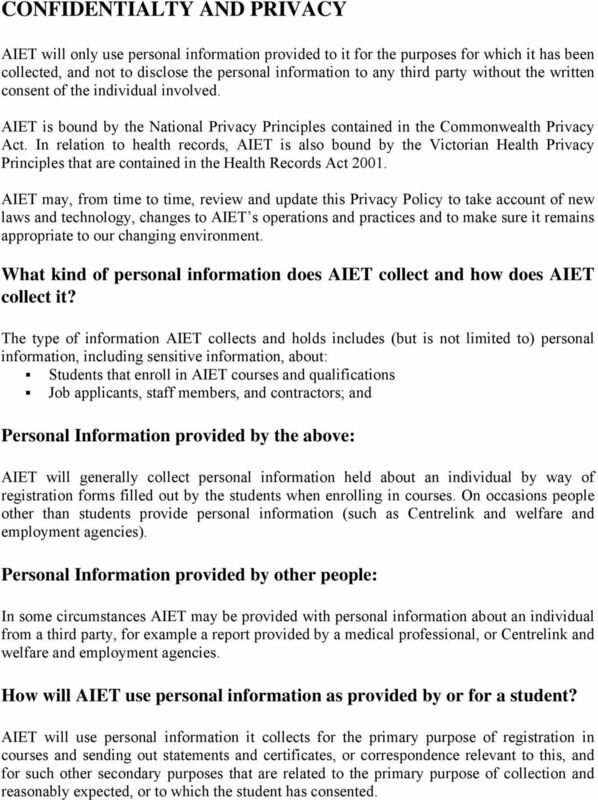 Under the Commonwealth Privacy Act and the Health Records Act, an individual has the right to obtain access to any personal information which AIET holds about them and to advise AIET of any perceived inaccuracy. There are some exceptions to this right set out in the applicable legislation. To make a request to access any information AIET holds about a student, the individual is required to contact the Administrative Officer in writing. 11 STUDENT SATISFACTION Student satisfaction surveys are conducted a minimum of once per year. The completion of student satisfaction / feedback forms is conducted with the principles of confidentiality and privacy of individuals kept in mind. The outcomes of the survey are intended to provide AIET with information about the quality of the delivery of training and assessments undertaken by the trainer of the program, and are used as part of our policy of Continuous Improvement Your trainer will provide you with access to the online feedback system, and we ask that it is completed and submitted via the web portal. The feedback forms are completed anonymously. 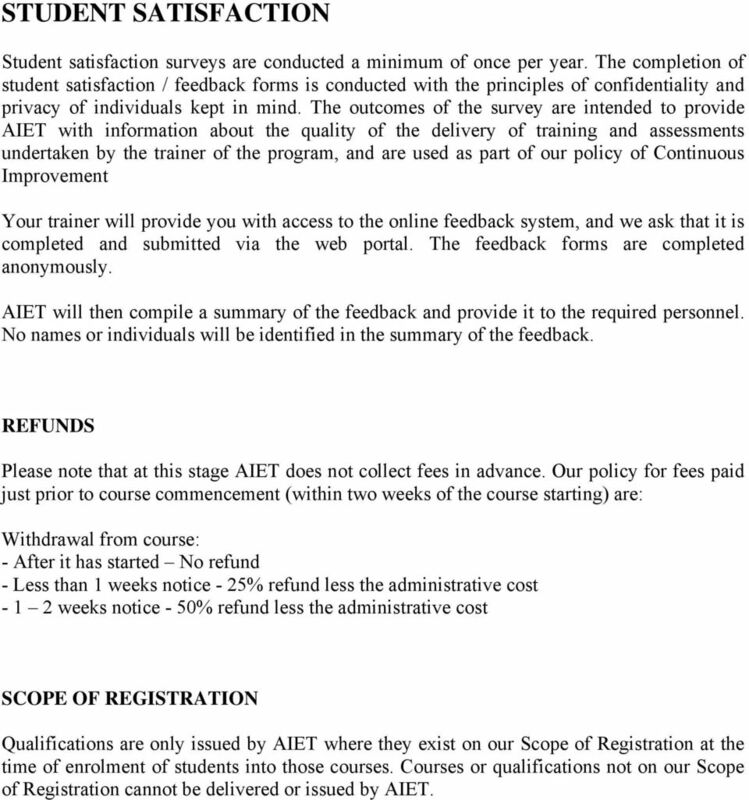 AIET will then compile a summary of the feedback and provide it to the required personnel. No names or individuals will be identified in the summary of the feedback. REFUNDS Please note that at this stage AIET does not collect fees in advance. Our policy for fees paid just prior to course commencement (within two weeks of the course starting) are: Withdrawal from course: - After it has started No refund - Less than 1 weeks notice - 25% refund less the administrative cost weeks notice - 50% refund less the administrative cost SCOPE OF REGISTRATION Qualifications are only issued by AIET where they exist on our Scope of Registration at the time of enrolment of students into those courses. Courses or qualifications not on our Scope of Registration cannot be delivered or issued by AIET. 13 Learners are encouraged by the fact that their experience is valuable and that they have existing abilities (competence) A saving is made on training time and costs associated with training Learners are not sitting through sessions that repeat what they already know and can do Qualifications can be completed in a shorter time or time be given to areas requiring more time to develop competence AIET has produced RPL / RCC-Self assessment guides for students. These guides provide information on how to apply for recognition and how to determine if the student s previous experiences support a claim being submitted for RPL / RCC. If your trainer/facilitator (employed by AIET) has not discussed RPL / RCC or some form of recognition, please contact the offices of AIET for information and help with RPL / RCC. 15 AIET trainers provide support to all students to assist their individual understanding and therefore hopefully avoid any need for cheating. Extra tutorial days are scheduled to provide support to students. Assessors discovering cheating of any kind will firstly discuss the issue with the student. If the situation is not resolved then it will be referred to one of the directors of AIET for further action. Possible disciplinary actions could include forced reassessment of the student or in extreme circumstances the removal of student from the course. 17 are competent, then you are assessed as Not Yet Competent. One of the key elements of competency-based assessment is that there are no grades or marks given you are either competent, or not yet competent. FEES AND CHARGES AIET charges fees directly to you or your organisation. Each organisation has a different policy on how they collect and recover VET fees from their participating students. Fee-paying students will be invoiced prior to course commencement. AIET does not collect fees in advance. STUDENT SUPPORT If you have specific individual needs, you should in the first instance discuss them with your trainer. Your trainer or supervisor will notify you of the support services that are available within your organisation, AIET or external support services, such as a nurse, disability support, literacy and numeracy support, psychologist, Student / Staff Welfare Coordinator, interpreters, Peer Support Network, etc. If you believe that your needs are not being met, we invite you to contact us for a confidential discussion. 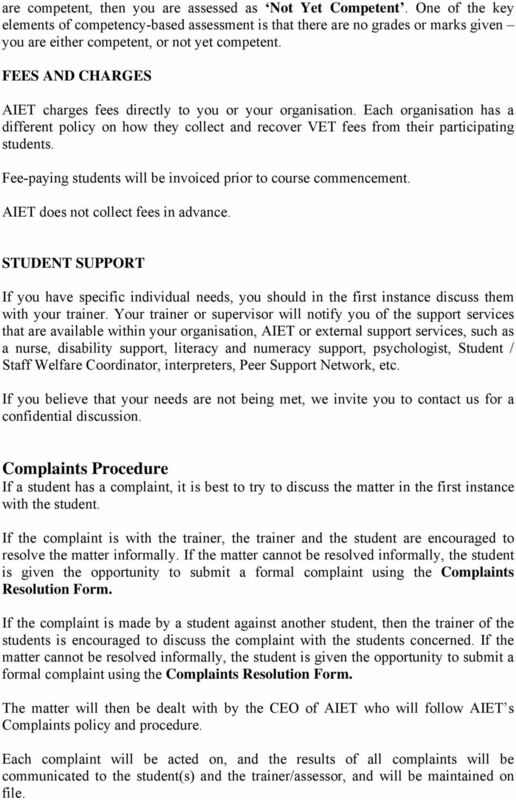 Complaints Procedure If a student has a complaint, it is best to try to discuss the matter in the first instance with the student. If the complaint is with the trainer, the trainer and the student are encouraged to resolve the matter informally. If the matter cannot be resolved informally, the student is given the opportunity to submit a formal complaint using the Complaints Resolution Form. If the complaint is made by a student against another student, then the trainer of the students is encouraged to discuss the complaint with the students concerned. If the matter cannot be resolved informally, the student is given the opportunity to submit a formal complaint using the Complaints Resolution Form. 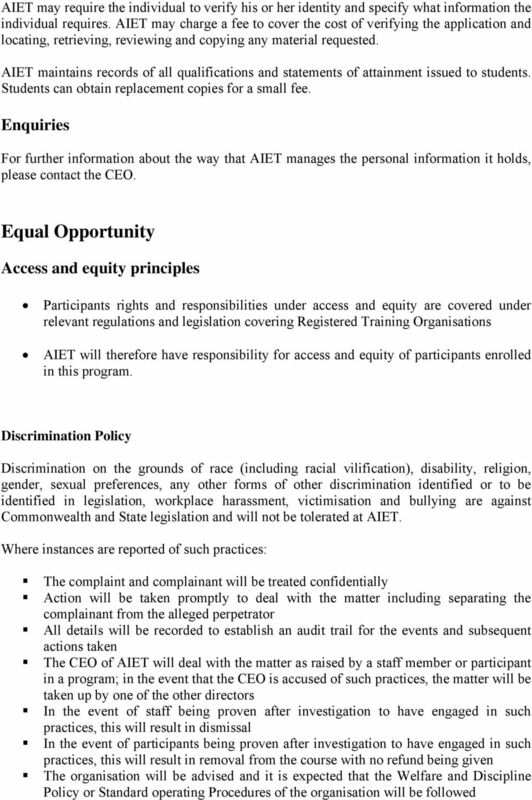 The matter will then be dealt with by the CEO of AIET who will follow AIET s Complaints policy and procedure. Each complaint will be acted on, and the results of all complaints will be communicated to the student(s) and the trainer/assessor, and will be maintained on file. 18 Appeals Students have the right to appeal against an assessment decision. They will be advised to discuss the nature of their appeal in the first instance with the assessor who assessed their submission. 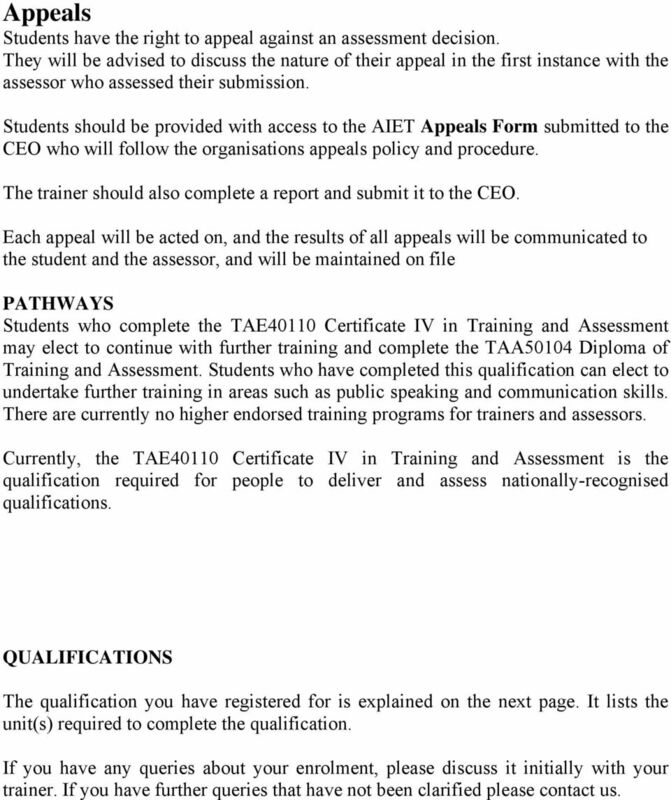 Students should be provided with access to the AIET Appeals Form submitted to the CEO who will follow the organisations appeals policy and procedure. The trainer should also complete a report and submit it to the CEO. 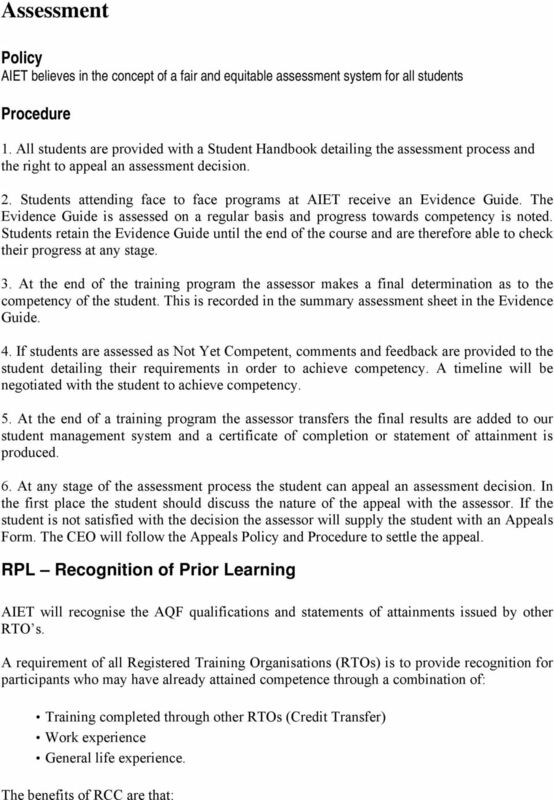 Each appeal will be acted on, and the results of all appeals will be communicated to the student and the assessor, and will be maintained on file PATHWAYS Students who complete the TAE40110 Certificate IV in Training and Assessment may elect to continue with further training and complete the TAA50104 Diploma of Training and Assessment. Students who have completed this qualification can elect to undertake further training in areas such as public speaking and communication skills. There are currently no higher endorsed training programs for trainers and assessors. Currently, the TAE40110 Certificate IV in Training and Assessment is the qualification required for people to deliver and assess nationally-recognised qualifications. QUALIFICATIONS The qualification you have registered for is explained on the next page. It lists the unit(s) required to complete the qualification. If you have any queries about your enrolment, please discuss it initially with your trainer. If you have further queries that have not been clarified please contact us. 19 COURSE STRUCTURE The Certificate IV in Training and Assessment (TAE40110) replaces the Certificate IV in Assessment and Workplace Training (TAA40104) - the required qualification for trainers delivering and assessing against Units of Competency from endorsed National Training Packages or accredited courses. The qualification comprises ten (10) units: seven core (C) and three elective (E) units. TAEASS401B Plan assessment activities and processes C TAEASS402B Assess competence C TAEASS403B Participate in assessment validation C TAEDEL401A Plan, organise and deliver group-based learning C TAEDEL402A Plan, organise and facilitate learning in the workplace C TAEDES401A Design and develop learning programs C TAEDES402A Use training packages and accredited courses to meet client needs C A.I.E.T. has chosen the following set of elective units to meet the Qualification Packaging Rules because we believe this combination of units best reflect the role of a workplace trainer/assessor. 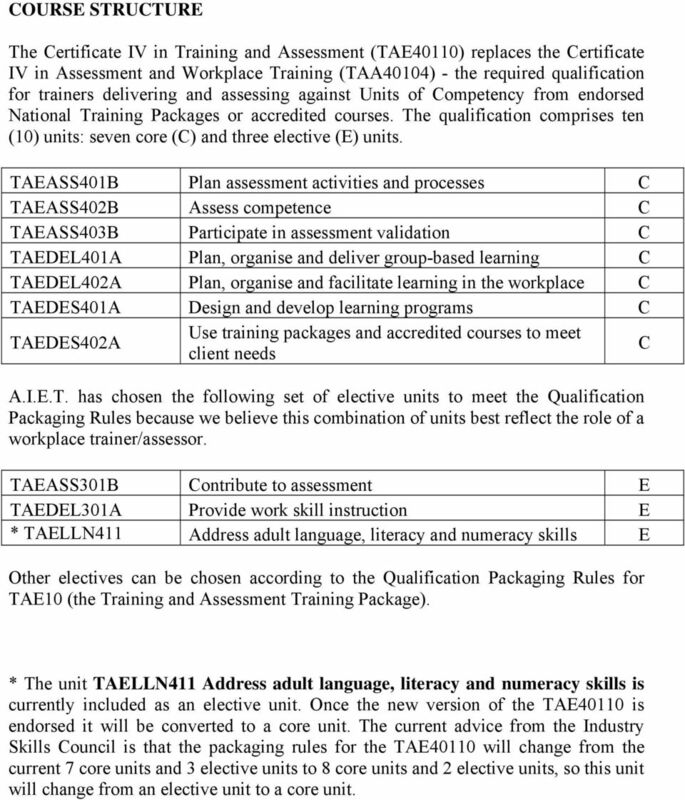 TAEASS301B Contribute to assessment E TAEDEL301A Provide work skill instruction E * TAELLN411 Address adult language, literacy and numeracy skills E Other electives can be chosen according to the Qualification Packaging Rules for TAE10 (the Training and Assessment Training Package). * The unit TAELLN411 Address adult language, literacy and numeracy skills is currently included as an elective unit. Once the new version of the TAE40110 is endorsed it will be converted to a core unit. The current advice from the Industry Skills Council is that the packaging rules for the TAE40110 will change from the current 7 core units and 3 elective units to 8 core units and 2 elective units, so this unit will change from an elective unit to a core unit. 21 Assessment requirements for each unit TAEASS401B Unit descriptor Employability skills Prerequisite units Co-requisite units Application of the unit Critical aspects for assessment and evidence required to demonstrate competency in this unit Plan assessment activities and processes This unit describes the performance outcomes, skills and knowledge required to plan and organise the assessment process, including recognition of prior learning (RPL), in a competency-based assessment system. It also includes the development of simple assessment instruments. This unit contains employability skills. This unit typically applies to assessors and workplace supervisors with assessment planning responsibilities; and trainers or other assessors responsible for planning assessment, including RPL. 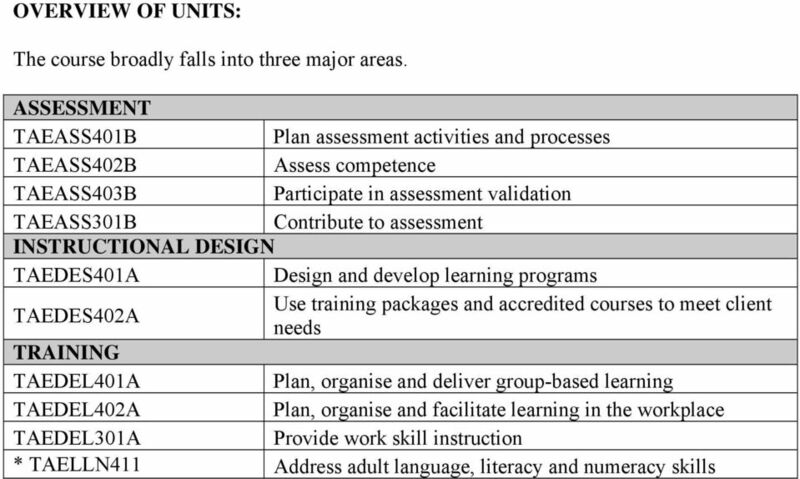 The unit is suitable for those with an existing assessment strategy which documents the overall framework for assessment. Evidence of the ability to: plan and organise the assessment process on a minimum of two occasions collect evidence that demonstrates: documented assessment plans having covered a range of assessment events catering for a number of candidates different competency standards or accredited curricula an RPL assessment contextualisation of competency standards and the selected assessment tools, where required incorporation of reasonable adjustment strategies development of simple assessment instruments for use in the process organisational arrangements. 22 TAEASS402B Unit descriptor Employability skills Prerequisite units Co-requisite units Application of the unit Critical aspects for assessment and evidence required to demonstrate competency in this unit Assess competence This unit describes the performance outcomes, skills and knowledge required to assess the competence of a candidate. This unit contains employability skills. This unit typically applies to assessors. Evidence of the ability to: assess competence of a number of candidates within the vocational education and training context against different units of competency or accredited curricula, following the relevant assessment plan assess at least one candidate for RPL consider reasonable adjustment and the reasons for decisions in at least one assessment cover an entire unit of competency and show: the application of different assessment methods and tools involving a range of assessment activities and events two-way communication and feedback how judgement was exercised in making the assessment decision how and when assessment outcomes were recorded and reported assessment records and reports completed in accordance with assessment system and organisational, legal and ethical requirements how the assessment process was reviewed. 23 TAEASS403B Unit descriptor Employability skills Prerequisite units Co-requisite units Application of the unit Competency field Unit sector Critical aspects for assessment and evidence required to demonstrate competency in this unit Participate in assessment validation This unit describes the performance outcomes, skills and knowledge required to participate in an assessment validation process. This unit contains employability skills. This unit typically applies to assessors participating in assessment validation. It does not address leading the validation process. Assessment Evidence of the ability to: actively participate in a minimum of two validation sessions or meetings which, in combination, address the critical aspects of validation using different validation approaches and activities clearly explain purposes of validation and the legal and ethical responsibilities of assessors collate documentation relating to validation process in a logical manner demonstrate communication and liaison with relevant people provide feedback and interpret documentation in validation sessions record contribution to validation findings. 24 TAEDEL401A Unit descriptor Employability skills Prerequisite units Co-requisite units Application of the unit Unit sector Critical aspects for assessment and evidence required to demonstrate competency in this unit Plan, organise and deliver group-based learning This unit describes the performance outcomes, skills and knowledge required to plan, organise and deliver training for individuals within a group. This unit contains employability skills. This unit typically applies to a person working as an entry-level trainer, teacher or facilitator in or with a training and assessment organisation. The person will be working from a learning program developed by someone else, and structuring the learning around that program. Delivery and facilitation Evidence of the ability to: facilitate group-based learning by preparing and delivering a series of training sessions, including: at least two consecutive sessions that follow one of the learning program designs at least one session delivered to a different learner group, with evidence of how the characteristics and needs of this group were addressed identify and respond to diversity and individual needs access and use documented resources and support personnel to guide inclusive practices. 25 TAEDEL402A Unit descriptor Employability skills Prerequisite units Co-requisite units Application of the unit Unit sector Critical aspects for assessment and evidence required to demonstrate competency in this unit Plan, organise and facilitate learning in the workplace This unit describes the performance outcomes, skills and knowledge required to plan, organise and facilitate learning for individuals in a workplace. This unit contains employability skills. This unit typically applies to a person working as an entry level trainer, teacher or facilitator, team leader or workplace supervisor, or any employee responsible for guiding learning through work. Delivery and facilitation Evidence of the ability to: prepare and facilitate work-based learning provide evidence of a minimum of two examples of developing work-based learning pathways, that include: identifying needs for learning analysing work practices, work environment and work activities organising and allocating work in a way that reflects learning needs and provides effective learning opportunities through work processes provide a minimum of two examples of a learning facilitation relationship being conducted: with different individuals demonstrating communication skills and flexibility demonstrating one or more of the processes or techniques identified. 26 TAEDES401A Unit descriptor Employability skills Prerequisite units Co-requisite units Application of the unit Unit sector Critical aspects for assessment and evidence required to demonstrate competency in this unit Design and develop learning programs This unit describes the performance outcomes, skills and knowledge required to conceptualise, design, develop and review learning programs to meet an identified need for a group of learners. The unit addresses the skills and knowledge needed to identify the parameters of a learning program, determine the design, outline the content and review its effectiveness. This unit contains employability skills. This unit typically applies to a trainer or facilitator who designs or develops learning programs. A learning program can be discrete, providing a planned learning approach that relates to specific learning and training needs, or it may form part of the learning design for a qualification. Learning design Evidence of the ability to: design, develop and review learning programs within the VET context prepare and develop a minimum of two learning programs: that contain differentiated learning program designs to reflect particular needs, contexts and timelines at least one of which must be based on competency standards or accredited courses and must cover at least one entire unit of competency or accredited course module. 27 TAEDES402A Unit descriptor Employability skills Prerequisite units Co-requisite units Application of the unit Unit sector Critical aspects for assessment and evidence required to demonstrate competency in this unit Use training packages and accredited courses to meet client needs This unit describes the performance outcomes, skills and knowledge required to use training packages and accredited courses as tools to support industry, organisation and individual competency development needs. This unit contains employability skills. This unit typically applies to a person working in or with training and/or assessment organisations as an entrylevel trainer, teacher, facilitator or assessor. It assumes that the person is working from a pre-defined training product, such as a training package or accredited course, and applying that product to meet client needs. Learning design Evidence of the ability to: analyse a training package and or accredited course to examine its component parts, identify relevant units of competency or modules, and contextualise those to meet a specific client need demonstrate a minimum of two examples of analysing training specifications, including at least one training package; the other may be another training package or an accredited course that meets a specific client need. 28 TAEASS301B Unit descriptor Employability skills Prerequisite units Co-requisite units Application of the unit Unit sector Critical aspects for assessment and evidence required to demonstrate competency in this unit Contribute to assessment This unit describes the performance outcomes, skills and knowledge required to contribute to the assessment process. This unit contains employability skills. This unit typically applies to a person with technical or vocational expertise who is in a supervisory or mentoring/coaching work role and for whom collecting evidence for assessment is an adjunct to principal work responsibilities. This unit is performed under the following conditions: the necessary assessment tools and assessment resources to guide the evidence collection process have been provided any adjustments to tools are determined by the qualified assessor (as defined by the Australian Quality Training Framework and the assessor requirements of the relevant training package), who provides guidance and supervision. Assessment Evidence of the ability to: carry out a minimum of three evidencegathering activities, with different candidates for each activity present documentation of the evidence in a clear and concise manner present documented feedback from others involved in the assessment. 29 TAEDEL301A Unit descriptor Employability skills Prerequisite units Co-requisite units Application of the unit Unit sector Critical aspects for assessment and evidence required to demonstrate competency in this unit Provide work skill instruction This unit describes the performance outcomes, skills and knowledge required to conduct individual and group instruction and demonstrate work skills, using existing learning resources in a safe and comfortable learning environment. The unit covers the skills and knowledge required to determine the success of both the training provided and one s own personal training performance. It emphasises the training as being driven by the work process and context. This unit contains employability skills. This unit supports a wide range of applications across any workplace setting and so can be used by any organisation. Its use is not restricted to training organisations. Delivery and facilitation Evidence of the ability to: carry out a minimum of three training sessions, involving demonstrating and instructing particular work skills for different groups; with each session addressing: different learning objectives a range of techniques and effective communication skills appropriate to the audience. 30 TAELLN411 Unit descriptor Employability skills Prerequisite units Co-requisite units Application of the unit Address adult language, literacy and numeracy skills This unit describes the skills and knowledge a vocational trainer or assessor requires to identify language, literacy and numeracy (LLN) skill requirements of training and the work environment, and to use resources and strategies that meet the needs of the learner group. This unit contains employability skills. The unit applies to individuals who teach, train, assess and develop resources. Competence in this unit does not indicate that a person is a qualified specialist adult language, literacy or numeracy practitioner. Unit sector Critical aspects for assessment and evidence required to demonstrate competency in this unit No licensing, legislative or certification requirements apply to this unit at the time of publication. Language, literacy and numeracy practice Gather evidence to demonstrate consistent performance in conditions that are safe and replicate the workplace. Conditions must be typical of those experienced in the training and assessment environment and include access to: exts and tasks typically found in the workplace pecialist LLN practitioners for consultation and verification of approaches raining and assessment tools based on the ACSF levels raining package support materials orkplace-specific tools, equipment, materials and industry software packages (where applicable). Skills must be demonstrated with real vocational learners. Assessors must satisfy NVR/AQTF assessor requirements. 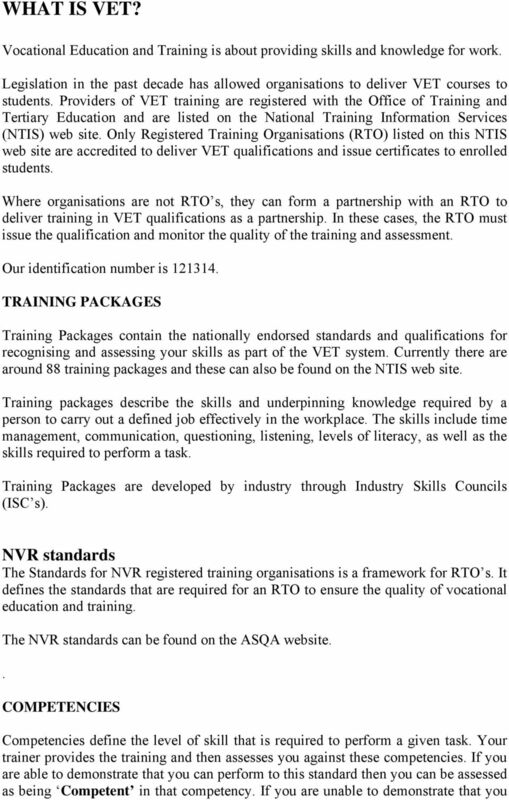 RTO - CODE OF PRACTICE Activ Pathways has developed a Code of Practice to address and establish our commitment to the maintenance of high standards in the provision of vocational education and training.